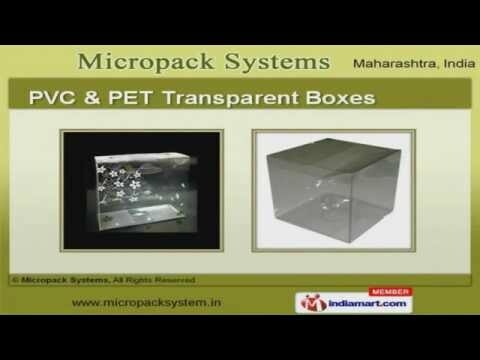 Welcome to Micropack Systems, Manufacturer and Exporter of PET, PVC, PP and Acetate Boxes. The company was established in 1993 at Mumbai. We have spread our wings to UK, USA and other countries. Stringent quality products, High tensile strength and Utmost client satisfaction are the strengths of our organization. We offer a vast range of PET Transparent Boxes, Blister Packaging and Trays. PET, PP and Acetate Boxes offered by us are widely acclaimed in the market. Our PVC and PET Transparent Boxes are available with us at cost effective prices. We are offering an attractive collection of PET, PP and PVC Printed Boxes that are best in the market. Our clients can avail from us an exquisite range of PVC Offset Printed and Cylindrical Boxes that are a class apart. Our Blister Packaging and Trays are appreciated amongst our clients for superior quality.